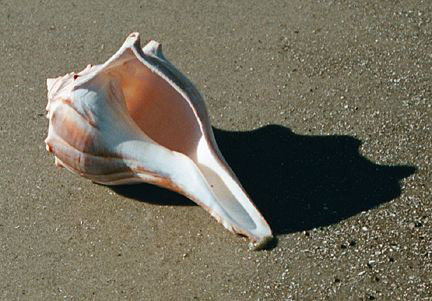 Christened the state seashell in 1987, the knobbed whelk is a whorled shell, eight inches long at maturity, displaying heavy spines, many knobs, and an orange or red mouth. Minerals in Georgia coastal waters cause ocher striations on the sand-colored, semi-gloss surface. This marine snail shell is found all along Georgia’s shoreline, out to 30 feet of water. While both the knobbed whelk and the lightning whelk have knobs on the edge of each whorl, the knobbed whelks on Assateague beach can be distinguished from the lightning whelks mainly by their right-sided openings (most gastropods are “right-sided”) and their slightly larger knobs. Knobbed whelks grow to eight or nine inches in shallow water along the coast from Massachusetts to northern Florida. Like lightning whelks, knobbed whelks feed on clams, and the females lay strings of egg capsules attached by one end in the sand. Photo provided by Ed Jackson.